For this Sunday's review, I tackled a cigar recently sent to me by Johnny from theweeklycigar.com. The La Riqueza No. 5 was released in 2008 by Pete Johnson (maker of the ever popular Tatuaje Cigars) and rolled by Don Pepin Garcia at his famous Tabacalera Cubana S.A. factory. 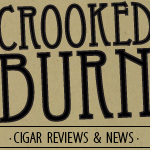 Pretty much everything these two guys have collaborated on recently has been getting high scores across all forms of cigar media. We'll see if my experience matches those of the big dogs in the industry. The Connecticut broadleaf wrapper on this cigar is beautiful. It had a deep brown chocolate color that is very smooth and oily. When holding this cigar it had a nice weight to it for its somewhat smaller size. Squeezing the cigar from foot to cap, it was well-packed and firm without any soft spots. The pre-light draw was free and tasted of natural tobacco with some hints of black pepper spice. The La Riqueza No. 5 lit very easily and started off producing tons of thick smoke. The initial flavors were of leather and natural tobacco with some spice that sat in the back of my throat. The spice was black peppery but not too overpowering. It was neither hot nor bitter. The texture of the smoke coated my mouth and felt very creamy and rich. The body of the cigar was a solid medium, reaching into the full range. In the second third of my La Riqueza No. 5, the spice that was lingering in the back of my throat all but disappeared. The leather notes seemed to fall back a bit also and the natural tobacco taste took the lead. At one point, I detected a slight cinnamon flavor but it did not last more then a few puffs. The draw was still very free and the cigar still produced tons of thick smoke that filled the room nicely. I did have to do one touch up with the torch, but again, I think this was due to me ignoring the cigar as I chatted with the other locals. The body of the cigar was a great medium that didn't cause any jitters or nicotine buzz. In the final third of my La Riqueza No. 5, the natural tobacco flavor was at it's fullest and overpowered anything else I could taste. This in no way was a bad thing, as the flavor was exceptionally clean and enjoyable. The finish on the cigar was very smooth and I didn't run into any of the problems I had read about with a bitterness creeping in. The burn line was straight and thin and continued to burn perfectly all the way to the nub. My final thought is that it's another winner for the Johnson/Pepin combo. If these guys keep coming out with more cigars like this one, I have no doubt that they will creep to the top spot of many reviewers' top ten lists (some already have them there.) This cigar is consistent from start to finish, producing tons of flavor and smoke volume. I enjoy a really nice medium body cigar and this one will definitely make it into my standard rotation. Would I buy a box? On a quick search, I found these listed online for $187.88 for a box of 25. To rich for my blood right now, but I would consider it if I fell into extra funds. Thanks for the review Dan. FYI, the wrapper was purchased from Oliva Tobacco Co. not Oliva Cigar. Two different companies and families. Thanks for the info Pete. I will admit that when I read Oliva I should have done more research. I'll fix that in the post. Sorry for the mix up. Keep up the good smokes. Great cigar. It tends to get lost in the mix with all of the Tatuaje blends. Diffently a sleeper. Oliva is a very common name in Latin America. Their is the Oliva Tobacco Company (They produce a lot of wrapper tobacco for companies like Fuente, Ashton and numerious others) Then their is the Oliva Cigar Co. from Nicaragua. Their is also the Fidel Oliva Family that runs the CAO & Torano factories.